Keeper gloves from Reusch, Uhlsport, adidas, Nike, Select and other top goalie gloves from around the world. Fingersave spines, ergonomic palms and many other styles are available to fit your needs. Goalie jerseys for kids, women, and men from adidas, Nike, Puma, Underarmour, Select and other styles can be customized and personalized online with your name, number and logo. Goalkeeper pants for all ages and sizes from Reusch, Uhlsport, and adidas are available here. These are a great way to protect your knees, hips, and thighs from hard keeper training. Shorts with padding for keepers provide great comfort when hitting the ground but also keep you cool in hot conditions. Take care of your smelly dirty keeper gloves with glove wash. Training accessories and keeper specific products available to maintain your game. Goalkeepers are one of the rarest breeds of soccer players. Keepers can wear their own gear on the field and show their personality. You will find a complete selection of goalie gloves, keeper jerseys, gk shorts, goalkeeper pants and other accessories. 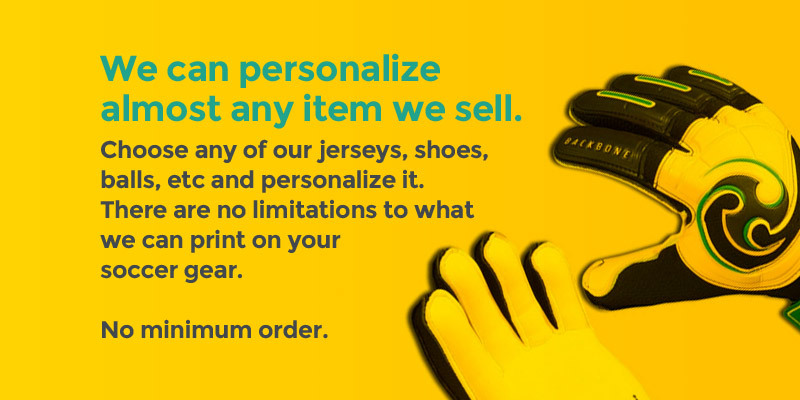 Most all items can be personalized and customized to match your uniform. Goalkeeping equipment and apparel have some very specialized companies like Reusch and Uhlsport that are top companies from Germany. Other major brands are adidas, Puma, Nike, Select, Diadora, and Vizari. We carry an assortment from each company that ranges from inexpensive affordable beginner level keeper gloves to youth soccer and high school to high performance professional gloves.